Journey by Starlight is a graphic novel that takes you on a historical journey through the discoveries of astronomers and physicists, kicking off in the year 1200 BCE and ending with the postmortem travels of Einstein’s brain. "Journey" is a very apt word apt to describe this work, as the reader is comfortably taken through the subject matter. 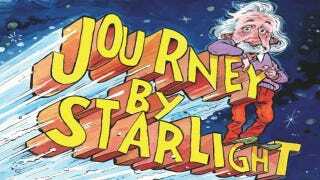 Journey by Starlight gives the reader a familiar guide, too — Albert Einstein. Einstein walks through time and space illustrating the principles and history of physics and astronomy with a single companion, an unseen narrator who plays the role of proxy for the reader and sometimes doubles as a conversation piece. Rife with science fiction and pop culture nods, the book offers us Imperial Star Destroyers hiding in the panels and Hitchhiker’s Guide to the Galaxy references. Ian Flitcroft, author and practicing surgeon, does not dumb the content down as he takes the reader down the road of more perilous subjects, with Britt Spencer’s deft illustrations providing an excellent pairing. Journey by Starlight appears reminiscent of teaching graphic novels like The Stuff of Life: A Graphic Guide to Genetics and DNA and Evolution: The Story of Life on Earth. I truly hope we will see more graphic novels of this nature in the future (along with with fantastic work of Zander Cannon and Kevin Cannon), as they make for excellent learning tools for the lapsed scientist or the individual who wants to take in a little high level physics before going to bed. During Journey by Starlight, the authors turn a keen eye to prideful scientists in the past two centuries in an effort to show how quickly views can radically change. Flintcroft and Spencer trade jabs regarding the follies of relatively modern scientists, making light of several shortsighted statements made by the 19th Century Scottish Mathematician and Physicist Lord Kelvin. Their goal is not to humble the deceased, but to point out how rapidly changes in theory and practice can occur in the realm of science. If you are a fan of the graphic novel format and looking for something other than superheroes in between your pages or an individual hoping to learn more about the inner workings of the world without picking up a daunting thousand page tome, grab a copy of Journey by Starlight and enjoy the afternoon. You can check out more art by Britt Spencer at brittspencer.com.